A GC we work with sent this photo and asked if we could install a 50amp car charger receptacle for a buddy of his. It has too many upper breakers to be a sit-bus panel. Not sure why the twin breakers were used and crowded up in the bottom with spaces available. What I find suspicious is a pest control sticker on the panel. You sure you want to open that thing up? cwsims84, lighterup and Takideezy like this. Look at the other sticker below the breakers HVAC, is that who installed it? Just looks like a 200A (if I can read that blur) MLO in a commercial facility. Why did they group those breakers that way? Who knows. Can you add the car charger to it? I'd suggest someone needs to do a load calc (which I always say when adding a load but I know Hack is going to chime in and say just add the load and don't worry about capacity). MechanicalDVR and cwsims84 like this. How dare you besmirch my good name? How dare you, Sir? cwsims84 and MikeFL like this. According to that diagram on the door, it is a split bus. It does seem to have too many spaces up top, but the diagram shows they're clearly separate buses. Normally a split bus diagram would show one bus powered from the other one. That one doesn’t. Odd. MikeFL and Southeast Power like this. Those empty spaces are where the main lugs are. That panel needs changed anyway, especially if they can afford a tesla. That diagram isn't what it appears to be, it's not a split bus. 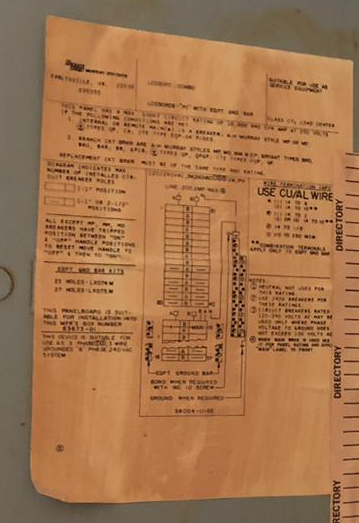 The top and bottom are two separate diagrams, I think main lug and main breaker. There are 30 spaces in the top diagram, all present and accounted for. The bottom diagram the main is backfed upper right. The squiggle part is to indicate the middle is omitted. Looking at it on the computer, I think you're right. This is just a panel where someone wanted to separate the DPs from the Spa. Diagram shows 15 spaces, panel has 16. maybe not the right cover? I wouldn't commit to anything without opening that panel first. Bird dog and MikeFL like this. I just learned about split-bus panels. I've never seen or heard of them before. Very interesting. I'd like to see it with the cover off. Here's a zoom of the label. Why not just cruise over there, crack that bad boy open and then make a well informed decision on what you can and can’t do. Last edited by cwsims84; Today at 01:04 PM. Why not just cruise over there, crack that bad boy open and then make a well informed decision on what you can and get do. I went over and... its a regular 30/40 garden variety load center. All of those spaces are for the taking. There is only one more "notched out" bus for twin breakers above the existing twins. The other spaces are for full size breakers. Last edited by Southeast Power; Today at 12:58 PM.